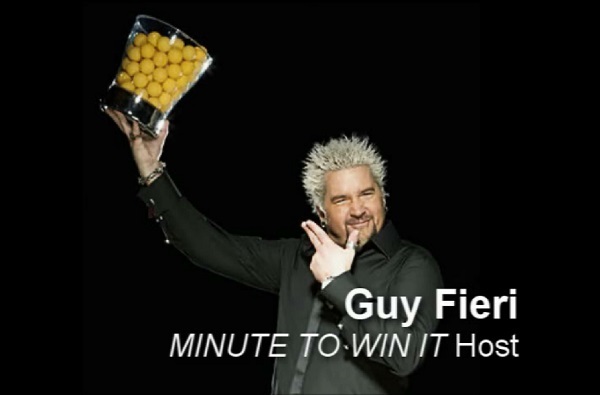 MINUTE TO WIN IT: Exclusive Guy Fieri Interview! Food Network chef, Guy Fieri will be making his entrance into network television Sunday, March14th onto NBC as the host of a new physical challenge game show called, “Minute to Win It”. HOLLYWOOD JUNKET spoke to Fieri Friday in an exclusive telephone interview during his Satellite Media Tour from his restaurant in Northern California. When asked about the “Mulligan” one contestant was given on the show who was given a second chance at her game, then after failing that, a completely new challenge, it seemed at first as though he was dodging the question but, then came back to it and answered it straight-on. He cited issues with the product (paper reams) that she was given to work with in that challenge. Fieri also spoke of potential new food challenging he and his sons are working-on at home that may be introduced on the show if NBC brings it back for another season. One such challenge he calls “The Ring-a-Ling”. Another challenge Fieri teased would be to starve contestants for 48 hours then bring them onto the stage to sit in front of their favorite food and challenge them to NOT eat it in the 60 seconds! Fieri also stated that the food challenges on the show were completely coincidental and not intentionally included in the show for his benefit. 127 HOURS on MINUTE TO WIN IT! Watch these interesting stunts involving food and everyday household items on the the two-hour season premiere March 14th on NBC. I watched the premiere on the 14th and I loved it. I thought Guy did a great job hosting and the crowd’s energy was almost unreal. Additionally, I thought whoever was tasked with coming up with the games for the show did a great job finding household-like items to use in cool ways.